What is ESPA’s National Celebrate Services Week? To create a week aimed at getting CSMs together locally, create camaraderie and be a springboard for future gatherings. To celebrate what we do! Being a key partner with meeting planners for making great meetings happen. That’s cause for celebration in and of itself. This is a great week to bring new CSMs into the ESPA mix – invite prospects and let them know about ESPA. 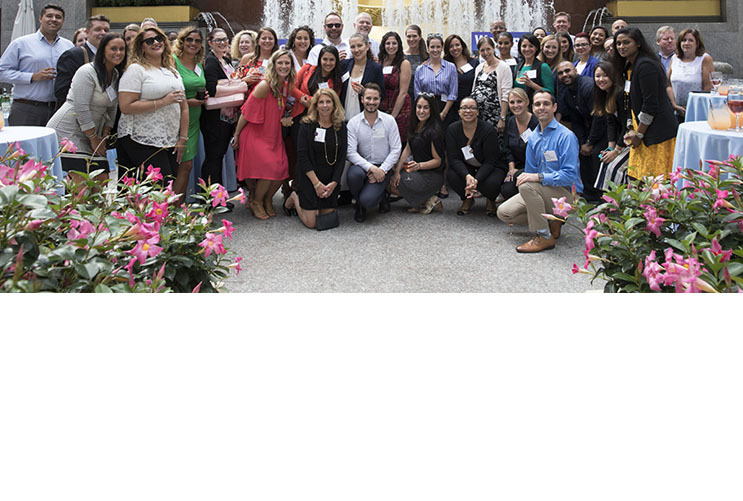 To support ESPA’s PR effort to spotlight services – get the word out to the meetings industry media about the important role of Convention Service. Not only are we celebrating services and the wonderful job we do every day executing great events, but we are also recognizing how many opportunities there are to give back, and how to incorporate them into events in our local communities. In 2018, 32 awesome ESPA members held events across North America. Check out the list. The next week of Celebration will take place July 29 -August 2, 2019. Getting Involved with ESPA’s National Celebrate Services Week is as simple as 1… 2… 3! Step 1: Host a local celebration or CSR activity. Step 2: Get Ready and Rock it Out during National Celebrate Services Week from July 29 to August 2! Step 3: Share How Your Event Went. We are looking for you, our wonderful ESPA members across North America to spearhead networking events during this week. For the fourth year we are encouraging our members to have a community service focus for National Celebrate Services Week – network while doing good! However you can host whatever type of event you’d like. ESPA will help give you the tools to plan it…and our members know better than anyone how to host an event. You can plan a single day event or do something ongoing during the whole week. C. Invite local ESPA members… and prospective members! To invite your local community, create an invitation and send it to your fellow CSMs. Remember to include the date, time of your event, a location and the theme. We have created a banner to help you create a themed invitation! Just download it and drop it into your email or other documents. Banner coming soon! The member directory on the ESPA website can be searched by city or state and of course the local CVB will have contact lists for other non-member CSMs who should be invited as future (hopefully) ESPA members! Once you have set up your event don’t forget to let ESPA Headquarters know about it. Complete our event form and Headquarters will spread the word about your event to our members. Make sure to check back here to see what your fellow CSMs have planned for NCSW 2019! Meet and greet your guests…have a welcoming committee. Collect names of ALL attendees (name, title, address, email, phone) so that they can be provided to ESPA. This is important, especially for prospective members that attend – ESPA wants to recruit them! Post on social media using our Twitter hashtag #ESPACelebrates and on our Facebook ! And of course have fun! ESPA will award the host with the most creative or unique event with a complimentary registration to the 2020 Annual Conference in Denver. The recipient will be selected based on a combination of theme, promotion, unique ideas incorporated in the event, and event follow-up with Headquarters. Step 3: Share How Your Event Went! Once your event is over make a note to follow up with your attendees– it is a great way to open the door to more networking with those who know your profession best, meet local colleagues and make new friends! Every year ESPA also highlights locations that exemplified giving back to the community and have provided Headquarters their photos and attendee list with the top location receiving a complimentary registration to ESPA’s Annual Conference. Send your photos and attendee list to info@espaonline.org to be eligible for this year’s complimentary conference registration! The Arlington Convention and Visitors Bureau invited local CSMs to one of the newest coffee and wine bars, Urban Alchemy, and spent time celebrating the work they all do across the city. Destination Cleveland held appreciation luncheons for Event Managers at the Huntington Convention Center of Cleveland and for Catering Managers with Levy Restaurants. The Detroit Metro CVB hosted a lunch for local Convention Service Managers to take a break from the busy summer together and network. Discover The Palm Beaches, along with local hotel and resort partners planed, purchased, and prepared dinner for the families that have children receiving treatment at St. Mary’s hospital. Their partners also collected household supplies for Quantum House. Experience Columbus held an informal gathering of local CSMs at one of the newest rooftop patios in Columbus, BrewDog and encouraged those invited to bring a donation for the local CHA Animal Shelter. The Fairmont Palliser team collected a number of items for the local Ronald McDonald House including gifts for parents and children as well as cleaning supplies for the house. They also raised money through a 50/50 draw to purchase a cloth-less high chair (or two!). The Fairmont Royal York promoted ESPA and National Celebrate Services Week at an event highlighting the hotel’s work in supporting the Toronto International Film Festival (TIFF). The Grapevine CVB held an appreciation reception co-hosted by the Hilton DFW Lakes for all of the partners in Event Services throughout the city. Included was a team building activity and putting together backpacks for GRACE, a local non-profit agency that provides relief to the local community in need. Greater Boston CVB provided yellow/lemon/sunshine themed baskets of treats to hotel and convention center service partners. Greater Lansing CVB invited attendees to a luncheon at the local baseball stadium and created blankets to donate to a local women & children’s shelter. NYC & Company hosted an afternoon networking reception at the McKittrick Hotel (the home of the immersive theatrical experience “Sleep No More”) and asked guests to bring art supplies to be donated to Materials for the Arts. Oklahoma City Convention and Visitors Bureau partnered with The CARE Center of Oklahoma City for a week full of donations and community involvement including bringing hotel partners breakfast treats and hosting a lunch to collect the toys and create back-to-school packs that are given to children. Richmond Region Tourism hosted a networking event and collected school supplies. The Swissotel Chicago provided breakfast and an omelet station to colleagues for a donation that will be used to purchase school supplies for SOS children’s villages. Tampa Convention Center and Visit Tampa Bay awarded CSM’s with CSM of the year awards and partnered to volunteer at the Ronald McDonald House in preparing dinner for the residents. Travel Portland collected donations for the Refugee Care Collective, a non-profit organization that provides resources for refugees who have resettled in Portland. Visit Anaheim’s Destination Services Team supported the Orange County Justice Center Foundation, with the collection of backpacks and school supplies. Visit Austin invited fellow Austin Convention Services Manager peers to a networking breakfast and to create a fun DIY craft project. In addition, they asked everyone to bring donations of toiletry items, hats or local bus passes for Front Steps, a pathway home for individuals affected by homelessness by offering emergency shelter, affordable housing, recuperative medical care, supportive services, and promotes community awareness. Visit Denver worked with Wish For Wheels for the 4th year. All hotels were invited to make a donation for a bike and join in building them. A reception followed to celebrate Convention Service Professionals. Visit Fort Worth showcased a new venue in the city, Pinstripes Bistro Bowling and Bocce as well as partnered with the Humane Society of North Texas to have foster puppies available for attendees to play with and possibly adopt. CSM partners were asked to bring specific donation items that the HSNT is in current need of. Visit Franklin held a weeklong celebration and created a Pineapple Award to award a service star in the community, delivered breakfast treats to hotel service departments and local first responders, collected hospitality items donated by hotels to give to the local children’s hospital, and ended the week with an ice cream treat break for hotel CSMs. Visit Frisco recognized Convention Service Managers, Event Managers and Catering Sales Managers with a ceremony and then equip each of hotel properties with a box to collect used or donated sporting equipment throughout the week for The Boys & Girls Club of Collin County. Visit Houston hosted a networking event at “Lucky Strike” Bowling Alley and asked attendees to bring school supplies for a donation to Hilliard Elementary School, a local school affected by Hurricane Harvey. Visit Indy provided two opportunities to engage with the community. CSMs were able to tour & donate to Teacher’s Treasure, which provides school supplies to local teachers, and encouraged CSMs to support the citywide conference by participating in their scheduled blood drive. Visit KC invited the downtown hospitality community to an event with the KCPD that supported the foster care/adoption community in Kansas City. Visit Raleigh hosted a food drive and a virtual (online) food drive to benefit the Food Bank of Central & Eastern NC and invited CSM attendees to host their own food drives. They also held a breakfast for the CSM’s to celebrate them and share drop-off locations for the food bank donations. Visit San Antonio kicked-off the week with a Breakfast and Award Celebration. Attendees also wrote thank you notes to the staff of Dress for Success. Visit Spokane’s citywide convention team is gathered twice; first to raise a glass at Maryhill Winery and secondly to have some coffee and treats the following morning. Waco Convention & Visitors Bureau and Waco Convention Center wanted to focus on celebrating the staff, thanking the partner hotels who work with us in Convention Services and to give back to the community including sending thank you notes and keychain gift to partner hotels, partnering with the City of Waco’s Parks & Recreation department in a tree planting ceremony, and a luncheon for all Waco CVB/Waco Convention Center staff to thank them for all of their hard work. The Westin Charlotte meetings and events team organized a school supply drive for Classroom Central; the department that collects the most supplies will get a pizza party. ESPA Headquarters/CMA Association Management collected pet supplies for local animal shelter Easel Animal Rescue League.